Karen E. Bender burst on to the literary scene a decade ago with her luminous first novel, Like Normal People, which garnered remarkable acclaim. 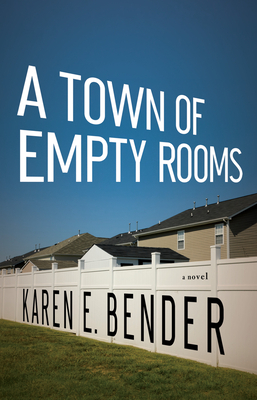 A Town of Empty Rooms presents the story of Serena and Dan Shine, estranged from one another as they separately grieve over the recent loss of Serena's father and Dan's older brother. Serena's actions cause the couple and their two small children to be banished from New York City, and they settle in the only town that will offer Dan employment: Waring, North Carolina. There, in the Bible belt of America, Serena becomes enmeshed with the small Jewish congregation in town led by an esoteric rabbi, whose increasingly erratic behavior threatens the future of his flock. Dan and their young son are drawn into the Boy Scouts by their mysterious and vigilant neighbor, who may not have their best intentions at heart. Tensions accrue when matters of faith, identity, community, and family all fall into the crosshairs of contemporary, small-town America. A Town of Empty Rooms presents a fascinating insight into the lengths we will go to discover just where we belong. Karen E. Bender is the author of a novel, Like Normal People. Her fiction has appeared in The New Yorker, Granta, Zoetrope, Ploughshares, Story, Harvard Review, The Iowa Review, and other magazines. Her stories have been anthologized in Best American Short Stories, Best American Mystery Stories, New Stories from the South: The Year's Best, and have won two Pushcart prizes. She has won grants from the Rona Jaffe Foundation and the NEA. She is also co-editor of the anthology Choice: True Stories of Birth, Contraception, Infertility, Adoption, Single Parenthood, and Abortion. She lives in North Carolina with her husband, novelist Robert Anthony Siegel, and their two children, and teaches creative writing at the University of North Carolina at Wilmington.